Notice: This product was discontinued on Dec 1, 2009. Multi-media display testers with many conveniences for your applications. Lets you measure luminance, contrast, flicker and chromaticity all with just one device. The low-cost design greatly reduces the product's price. Measurements for adjustment or inspection work are displayed both as digital values and bar graphs. User-specified MIN, MAX and other criteria can be entered for GO/NO-GO testing of production line samples. 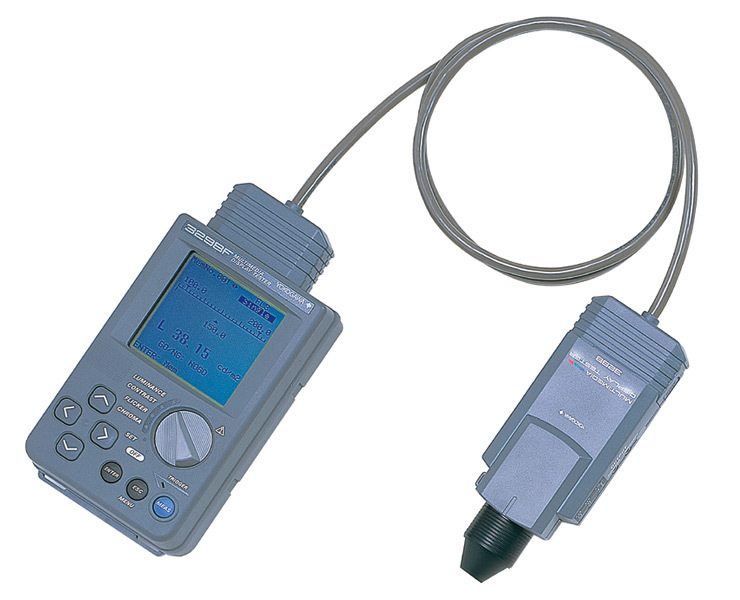 Color correction coefficients for three light source types (type A standard light source, three wavelength fluorescent lamp and CRT display) ensure accurate chromaticity measurements for each color and light source. In addition to a built-in memory with capacity to store measurement data for up to 200 displays, an RS-232 interface port included as standard equipment makes data communication and control from a PC simple. The shading cylinder type optical system lets you make easy measurements just by moving the sensor within range of the specimen. Displays luminance as a digital value and bar graph in a range of 0.01 to 40,000 cd/m². User-specified MIN, MAX and other criteria can be entered for GO/NO-GO testing. Measures the luminance of the "white" and "black" displays to instantaneously calculate and display the contrast. The calculated contrast is compared with the userset value for GO/NO-GO testing. Displays flicker ratio (ACrms/DC) as digital values (% and dB) and a bar graph. Useful for flicker adjustment. Displays GO or NO-GO for the measured value based on the userspecified reference color and range. A different color calibration coefficient can be set for up to 10 different display types and 6 reference colors, enabling more precise chromaticity measurements for each color in each display. Displays the difference between the RGBL measured values and the target values in real time. Measures the light's average luminance (DC) and effective flicker value (ACrms) to calculate and display the flicker ratio (ACrms/DC). The flicker of base frequencies between 20 and 90 Hz can be measured by varying the programmable low-pass filter's cutoff frequency. The flicker correction function enables conversions to flicker ratios (%, dB) defined by JEITA and VESA standards. The characteristics of the color filters in 3298F's photodetector approximate the CIE 1931 color matching functions, and the tester performs optimization calculations to minimize error. Each sensor is calibrated with a combination of a type A standard light source/threewavelength fluorescent lamp and color filters. The optimized coefficient calculated for each light source is used to enable high-precision color measurement. The 3298F displays RGBL levels for differences between Rm, Gm and Bm values (calculated from measured tristimulus values) and Rs, Gs and Bs values (calculated from the target color temperature/luminance) in real time. Displays can be djusted to the target color temperature/luminance by adjusting all their RGBL values to 100%.